Howdy to all my crafty friends! Thank you for stopping by today. I completed my next class in the Altenew Educator Certification program. This one is called Irresistible Inking Techniques. 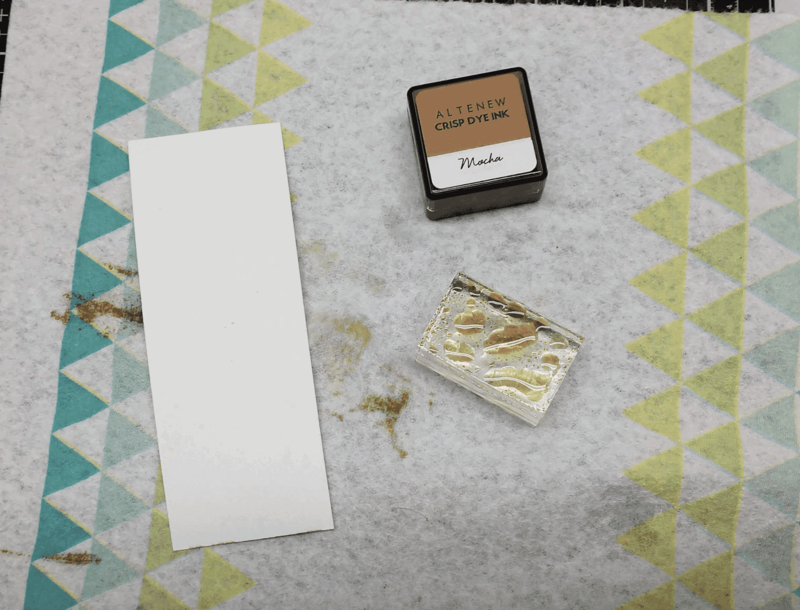 It is filled with several great ways to add ink to your projects. It was really hard to choose which one I liked the most! I decided to use stamp block inking as my main technique since I haven't done that more than once or twice before. I also used some direct to paper inking techniques. Check out this beauty! 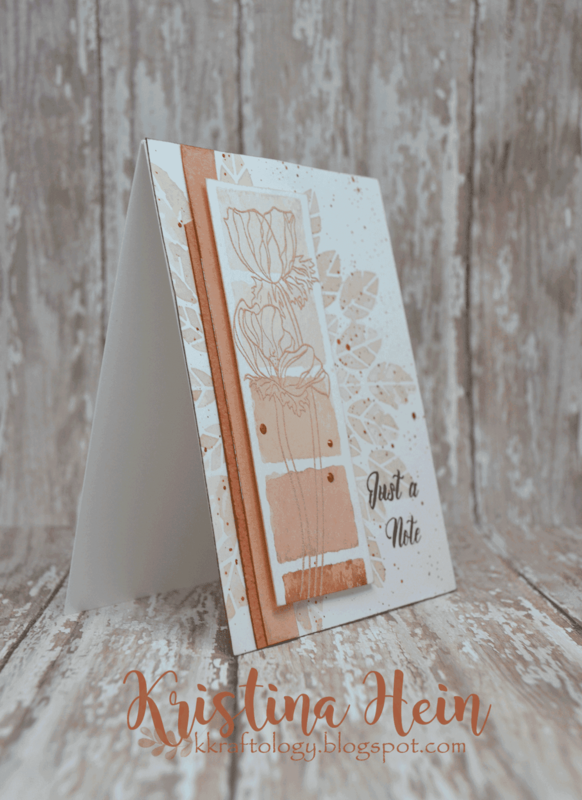 Let me walk you through the steps of how I created this card. First I cut a strip of Canson watercolor paper to 1 3/4" x 4 3/4". The width of my piece had been deteremined by the acrylic block I planned to use for the stamp block inking technique. My block measures 1 1/2" wide. 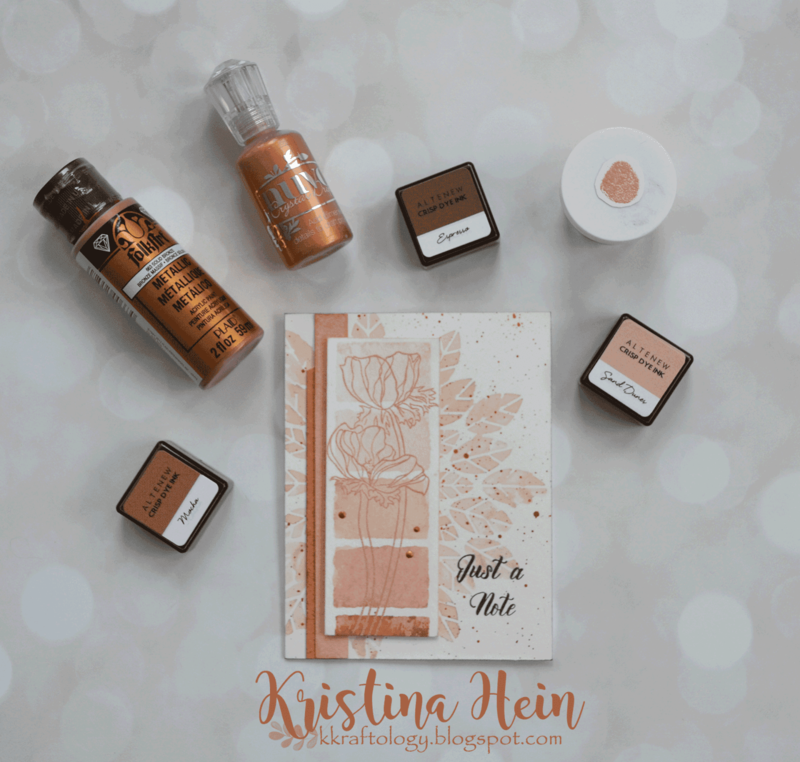 I chose to use the four different shades of brown inks included in the Altenew Coffee Break mini ink cube set. I started with Sand Dune. I just stamped it all over the block, spritzed it a few times with water and then laid it down on the watercolor paper. I applied pressure and held it there for a bit so the ink could soak into the paper. Then I pulled it off and dabbed up any excess water that I didn't want. I stamped with the Sand Dune ink twice and worked my way through the other three colors until I had covered the strip of paper. I set the strip aside to air dry. I moved on to the background. I cut another piece of watercolor paper down to 4 1/4" x 5 1/2". 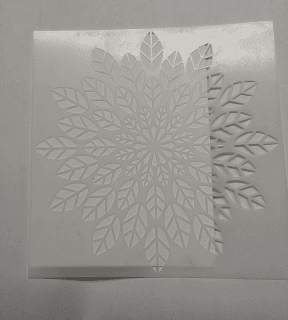 I laid the Leaf Burst stencil on top and taped it to the paper. 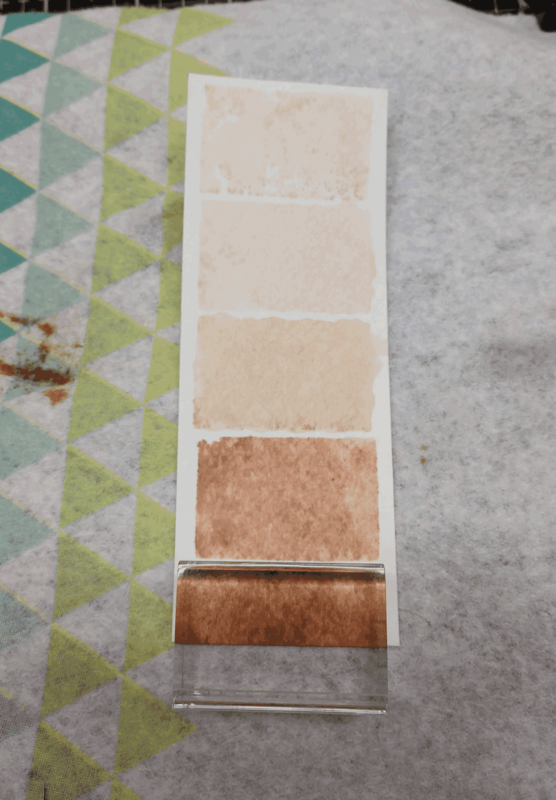 I do want to mention that I actually used the less textured side of the paper for this step. I had also tried it with the rough side but got a better result with the smoother side. I squished the Rocky Shores ink cube down onto my craft mat several times. Then I sprayed it liberally with a pearl shimmer spray. I mixed it together and applied it lightly over the stencil with a flat watercolor brush. A round brush would work just as well. Here it is after I removed the stencil. I used my heat tool to dry it so I could move on to the next step. I mixed a bronze metallic acrylic paint with water until it was thinner. Then I used a larger round brush to tap against a block to create a splatter all over the background. 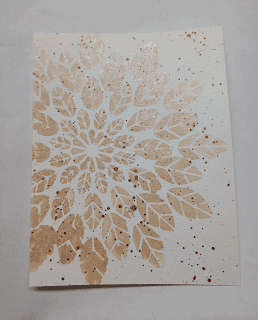 I did use a splatter box for this because I was really making a mess! I just love the extra shimmer and interest it adds to the panel! I set it aside to dry. Next I had a couple thin strips of watercolor paper that I wanted to watercolor to match the other colors. 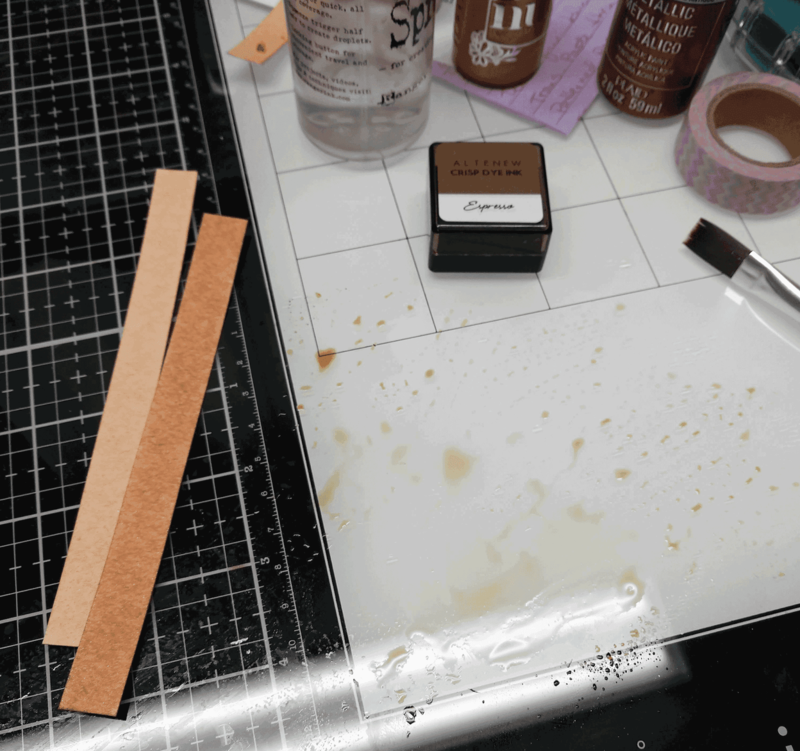 I squished the Espresso ink pad on my craft mat and added water. I then painted the color onto two different strips. I wanted one to be darker than the other so I dried it and painted it again three times. Now I went back to my original block watercolored piece. I went over it with anti-static powder first. 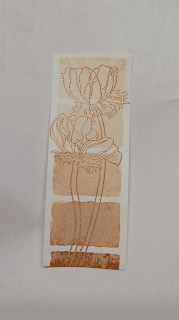 Next I stamped one of the flowers from the Wonderland stamp set with Versamark ink. 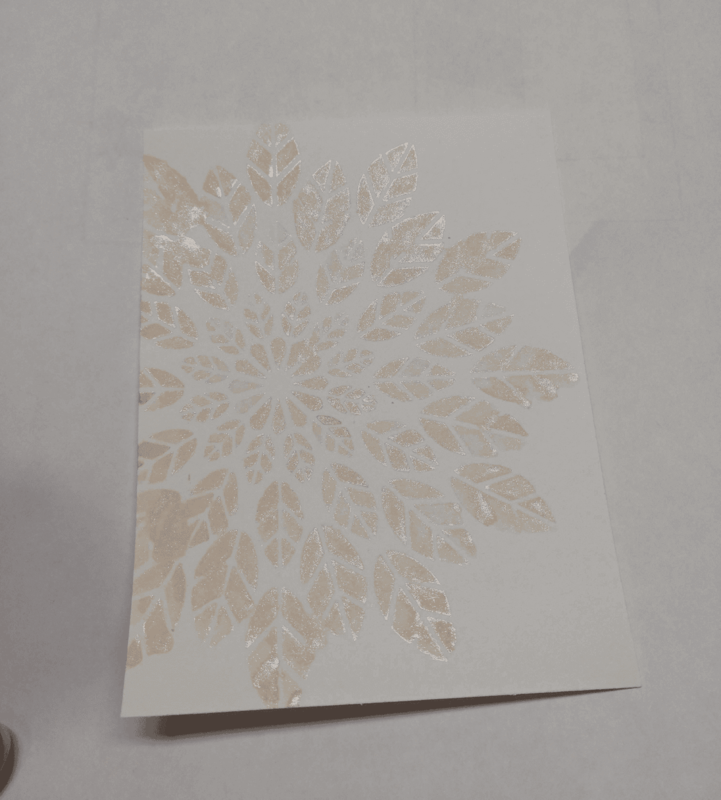 Then I sprinkled on a rose gold embossing powder and melted it with my heat tool. 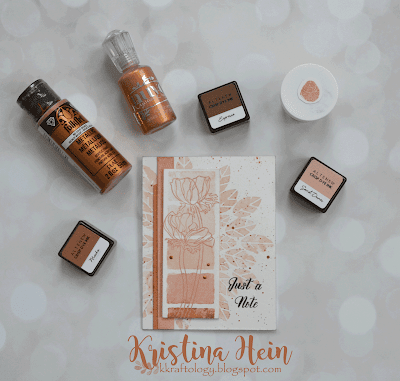 The rose gold embossing powder just went so well with these colors! 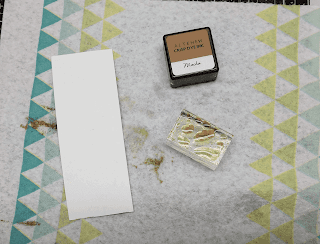 The inks are definitely brown when you stamp with them directly. It's when you add the water that the pink undertone really shines through! Now to put it all together. 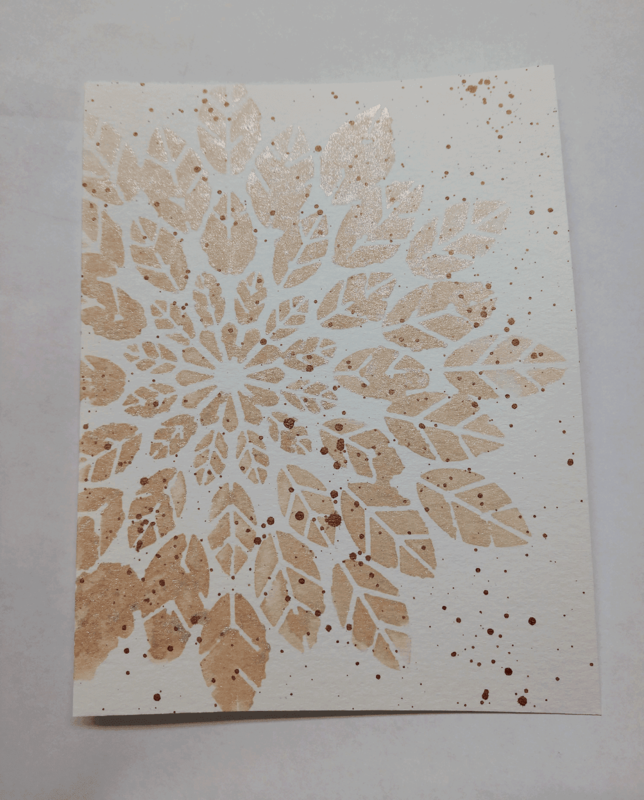 I did go around the edges of the background panel with the Espresso ink before I glued it onto a white A2 sized card base. Next I cut the darker strip of watercolor paper to be shorter than the other one. I did cut it at an angle to give it a little more interest. I glued it close to the left side of the card. Then I glued the lighter strip on top of it. I went around the edges of the floral panel with the Sand Dune ink, applied foam tape to the back and glued it over the strips. 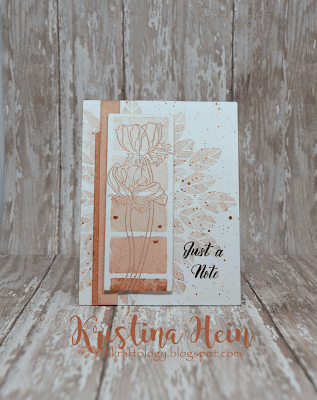 The sentiment also comes from the Wonderland stamp set. It was too big for the area I wanted to put it so I carefully cut it apart. I was then able to stack the sentiment instead. I stamped it using black Versafine ink. It's still my favorite black ink for dark and crisp black sentiments. For my finishing touch I added a couple of Copper Penny Nuvo drops to the floral panel. All done! This finishes up all of my classes for level 1. Now I get to see what my challenge project will be! Eep! Thanks for stopping by today. 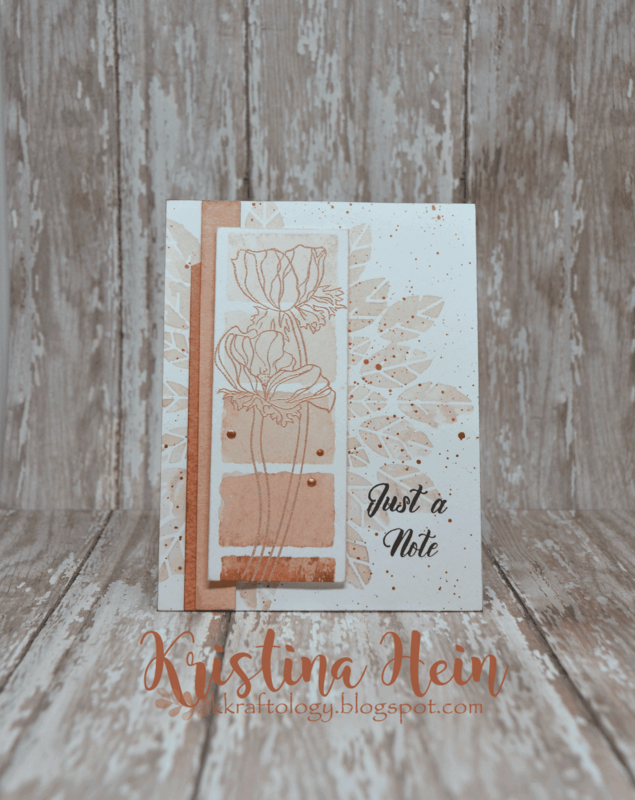 Love your creative process, Kristina! Love the layering and use of inks! Please be sure to edit the photos with more light. I know they look even more beautiful in person! Please refer to photography guide in the AECP Forum! Thanks so much for entering your beautiful work in Altenew AECP assignment Gallery. Beautiful colors and design. Well done!